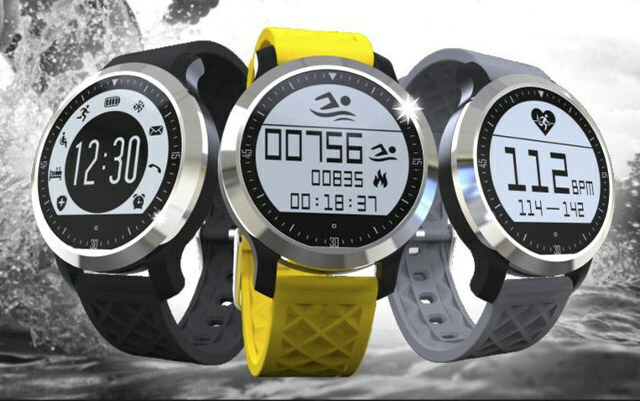 The market is flooded with wearables such as smartwatches and fitness trackers that all track activities (walking/running) with more or less accuracy, and while some offer good IP67 or IP68 ingress protection rating, or even better 5ATM rating, allowing them to be used in water, I have not found many that can actually track swimming patterns, especially among the cheaper ones. But that’s exactly what Makibes F69 sports smartwatch promises. Battery – 180 mAh charged via magnetic dock good for 6 days in power saving mode, 4 days in “healthy” hear rate mode, and 30 hours using the HRM in sports mode. The watch supports Bluetooth 4.x enabled smartphones with iOS 8 and Android 4.3 or greater. If it looks similar it’s because it’s basically the same model as Makibes F68, but with IP68 rating, swimming monitoring, and stainless steel replaces plastic. Both watches share most of the same function including call and message reminders (SMS, Facebook, Twitter, Wechat only), dual mode heart rate monitoring (health / sports), pedometer, sedentary reminder, sleep monitoring, alarm, and clock display. F69 adds swimming tracking for four types of strokes: freestyle, breaststroke, backstroke, and butterfly. HPlus Watch app can be downloaded from Google Play or iTunes. This looks not too bad in theory, but since I reviewed Makibes F68 watch, be prepared to be disappointed, as I’ve found quite a few issues in the older model: step count tracking is highly inaccurate, the heart rate monitor is finicky at least in sports mode, as sometimes it works sometimes it does not, there’s no backlight (not usable in the dark), the watch will often turn off by itself irregardless of battery charge, and requires the dock to get started. The good points are the always-on display and battery life is indeed 3 to 4 days with all-day “healthy” HRM enabled. Despite all the issues, I have never received a firmware via the Android app… It always fails with the message: “Upload failed: DFU FILE NOT FOUND”. In case you’d still like to give it a try I first found the watch on GeekBuying for $49.99, but you’ll also find it on Aliexpress for the same price. I saw another review saying that this one has backlight, are you sure it doesn’t? This was the most important improvement I was waiting over the F68. I’m not sure. This is not a review, just information I gathered from other websites. There’s no button on the watch, and no visible light sensor, so that means the backlight would likely have be activated each time you touch the screen be it day or night. If that’s the case, it does not seem to be a good design for battery life. You activate it by touching the screen for 2 sec. Original app breaks to often, and all the data is lost, is there any other app for this smartwatch? can it count laps/turnovers/swim distance, or just strokes ? I bought this watch it worked for one day. Then the screen stopped working. Does it work in saltwater, did anyone try? It’s waterproof so it will work in (salt)water. I did not try, but waterproof is waterproof (grade IP68). Depth of not more than 1 meter. Worked only for two days. And stopped. It’s dead. So I am not sure where to send this peace for repair. Does not work in salt water.